I’ve collected in this post Sony 50mm f/1.4 (also known as Sony SAL-50F14) reviews, samples, photos and galleries and a compilation of annotated links to related resources. The lens was tested on a Sony A700. It’s pretty extensive and has sample photos on the last page. The verdict states that image quality is vastly improved when the aperture is stopped down to f/2 while peak performance is reached at f/4. 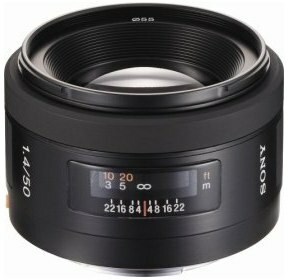 This forum post at DPReview.com links to three MTF charts comparing the Sony 50mm f/1.4 vs Canon EF 50mm f/1.4 and Nikon 50mm f/1.4D AF Nikkor lenses. The Sony 50mm f/1.4 gallery at PBase presents a limited number of randomly-selected images. Refresh your web browser to see the next set of photos.